I’m the co-director of Texas Low Income Housing Information Service (TxLIHIS), a statewide research, policy and advocacy organization which I helped found in 1988. 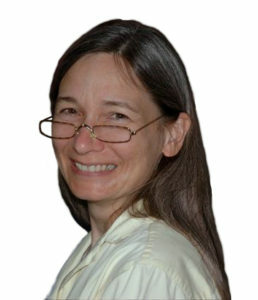 I am a member of the City of Austin Community Development Commission and chair of its Housing Committee. I grew up in Philadelphia and Dallas, graduating from W.T. White High School in Dallas. I earned a Bachelor’s degree in Government from the University of Texas at Austin and a Masters degree in Urban Affairs from the University of Delaware. 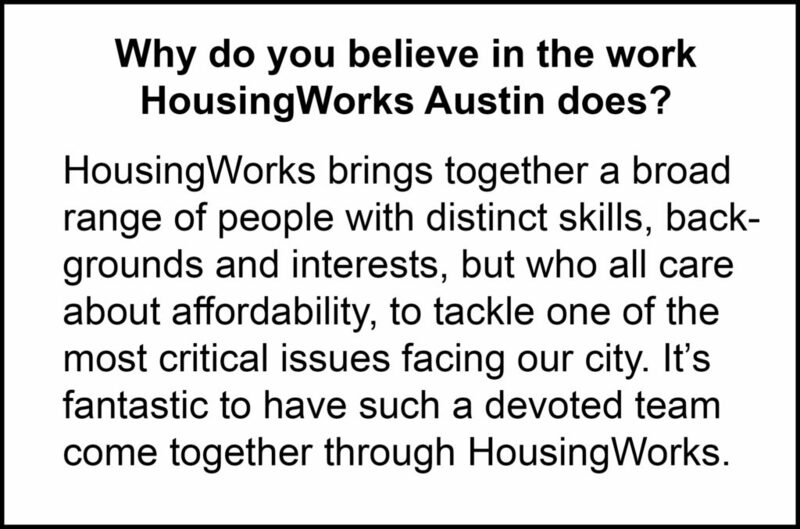 I got my start in housing by helping several neighborhood associations and community organizations in Austin and around Texas establish their own affordable housing programs. To give a couple of examples, one neighborhood association in Austin runs transitional housing for the homeless and a community organization in South Texas helps families earning minimum wage build their own safe, affordable homes. 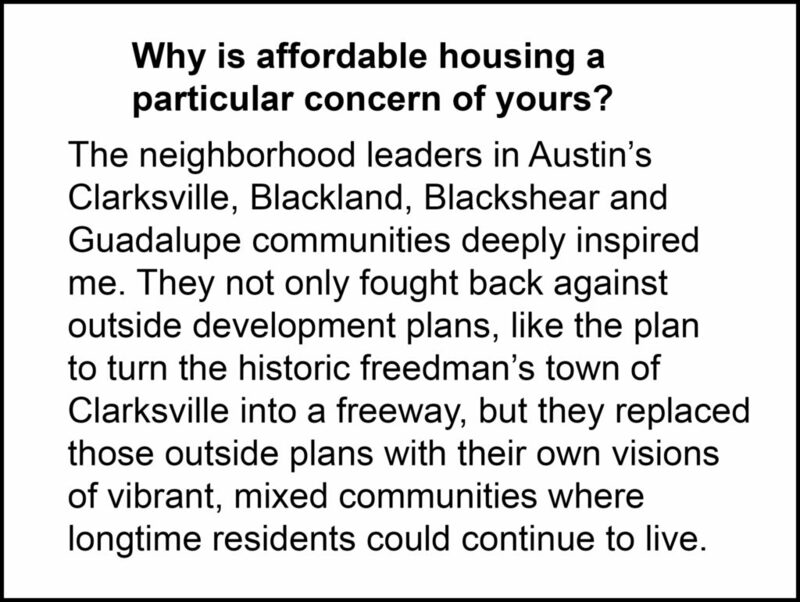 Much of the housing we built in Austin has helped those neighborhoods retain a measure of affordability in the face of accelerating gentrification. Along with many other housers, I helped conceptualize and build support for local affordability programs including the City of Austin’s Housing Trust Fund and General Obligation Bonds. There’s been a real impact – the programs have raised more than $130 million to help provide thousands of Austin residents with stable, safe homes that they can afford. More recently, we helped establish incentive programs, which create affordable homes at no cost to the taxpayers. These new programs have already made available to lower income Austinites hundreds of homes in parts of town with good schools, good jobs and a lack of affordable housing. Over the past few years, TxLIHIS has successfully improved the state government’s approach to rebuilding homes after natural disasters, assuring that low-income people are not left out of their community’s recovery. We’ve partnered with grassroots organizations around the state to overcome racial inequality and concentrated poverty, supporting efforts to improve housing choice for low-income people of color and the right of every neighborhood to have equal infrastructure and public services. I read. I recently finished Nate Blakeslee’s book, Tulia: Race, Cocaine, and Corruption in a Small Texas Town. My dog and I walk the greenbelt near my house noting what is in bloom, the volume of water flowing in the limestone-lined creek, and the variety of birds also enjoying the greenbelt. I cook, I travel and I try to keep a daily serving’s worth of salad greens growing year round.